In Music Love's latest Women in Music podcast, Michelle Grace Hunder speaks with Music Love about her career as one of the world's best hip-hop photographers, and also the founder of an all women in music portrait and documentary series called Her Sound Her Story. In this episode, Michelle demonstrates how well-versed she is in all things hip-hop from artists from around the world, but especially here in Australia. Growing up as a huge fan of the genre, a few years ago she noticed a that there were sub-groups of hip-hop in Australia that didn't fit neatly into the then popular category of Oz hip hop - acts like The Hilltop Hoods, for example - and wanted to shine a spotlight on other artists. As she started taking photos thanks to childhood buddy from her hometown of Shepparton Victoria, Briggs, things led to the self-publishing of a book called Rise which is a wonderful archive of 180 Australian artists. The book was so well received, it is now preserved in the National Film and Sound Archives of Australia. Michelle then went on to start a new project called Her Sound, Her Story, along with her creative partner film maker Claudia Sangiori Dalimore. The pair worked together to take photos of dozens of Australian women in music including Tina Arena, Montaigne, Vera Blue, and more, along with twelve six minute vignette documentaries which explored individual stories. Then, an event which launched Melbourne Music Week in 2016 was an all women line up of artists including Ella Hooper, Julia Stone, Mojo Juju and more. The project was a huge success and continues with the making of a feature length documentary and more photos and profiles coming soon. 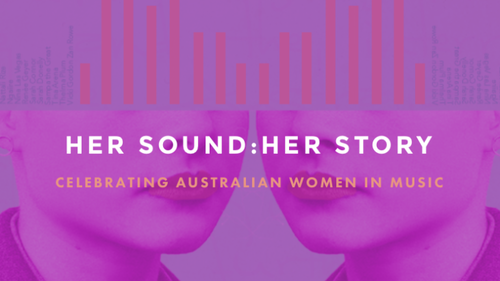 From the panels to the stages, BIGSOUND delivers lady powers in spades. Caiti Baker is one of of Australia's leading ladies of soul, but her journey has been marked with overcoming big struggles. She gets up close and personal in this must read interview.